The PSC Falcon 330 has been renamed to the Datalogic Falcon 330. Open standards, powerful applications and ease of use. Automatic Data Collection is the need of today's businesses striving for greater efficiency, productivity and cost-effectiveness. The Falcon 330 series by Percon is the answer. Open standards, powerful applications and ease of use allow these portable data collection terminals to integrate seamlessly into the supply chain systems of all companies involved in logistics, manufacturing, retail, warehousing and distribution. 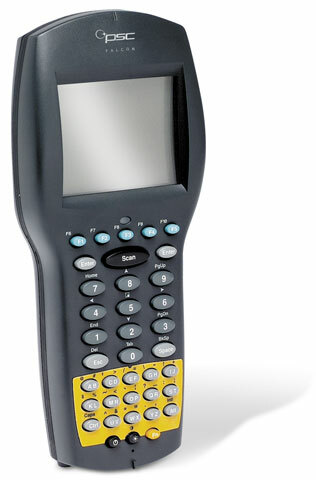 Batch Portable Data Terminal, 25 key Keypad with Standard Laser. 8MB RAM, 2MB flash, 38 key, 16 line display. Includes standard range scanner. Order cradle, cables, NiMH battery & power supply/AC adapter separately. See accessories. 8MB RAM, 2MB flash, 38 key, 16 line display. Order cradle, cables, NiMH battery & power supply/AC adapter separately. See accessories. No Scanner.